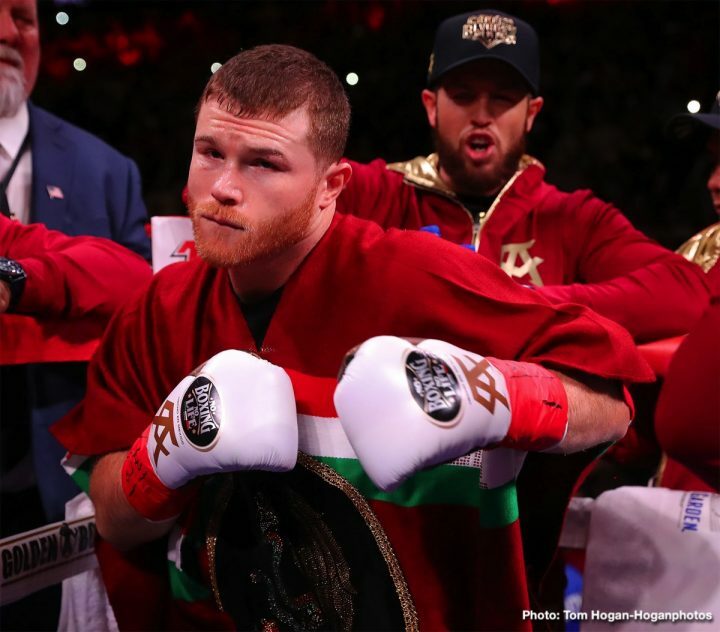 By Mike Smith: Oscar De Hoya says he’s got a shock in store for Saul Canelo Alvarez’s boxing fans when they announce the name of his next opponent on May 4 at the T-Mobile Arena in Las Vegas, Nevada. Golden Boy CEO De La Hoya isn’t dropping any hints about who Canelo’s opponent will be, but it looks like it’s not going to be IBF middleweight champion Daniel Jacobs. A Canelo opponent that would shock the fans would be Floyd Mayweather Jr. or Conor McGregor. Both of those fights would bring in a lot of money, but wouldn’t be entertaining. Mayweather made it boring against Canelo in 2013 with him just jabbing and throwing pot shots, and it would be the same type of fight in the rematch. Jacobs is the one that a lot of boxing fans are expecting Canelo to fight due to Jacobs’ promoter Eddie Hearn of Matchroom Boxing USA talking recently that negotiations will be starting soon for the Canelo-Jacobs fight for May 4. Hearn wants the Canelo-Jacobs fight so much that he talks about it in every interview. It sounds like Hearn is hoping he can talk enough about the Canelo vs. Jacobs fight in order to stir up interest from the boxing public. The problem with that is Jacobs lost recently to Gennady Golovkin last year, and he spent most of that fight running from GGG despite a huge size advantage. It looked bad. The fight was boring because of Jacobs timid fighting style. In Jacobs’ three fights since then, he’s looked barely better than his opponents in his wins over Luis Arias, Maciej Sulecki and Sergiy Derevyanchenko. Jacobs almost lost to Sulecki and Derevyanchenko. That’s not the way you want to see a fighter look before they face a superstar like Canelo. It’s safe to assume that Canelo WON’T be fighting Gennady Golovkin in a trilogy fight on the 4th of May. Golden Boy is going to let the Canelo-GGG third fight marinate for a while before they make that one. A very predictable opponent for Canelo’s next fight is WBO junior middleweight champion Jaime Munguia. He’s unbeaten, and co-promoted by Golden Boy Promotions. It helps Golden Boy if they make the Canelo vs. Munguia fight now rather than later. Canelo is still young enough to beat the 22-year-old Munguia. If Golden Boy waits a few years down the line, you might not be able to say that. Munguia will be in his mid-20s, and Canelo in his 30s. While it might sound old for a fighter to be in his early 30s, it could be old for Canelo. His game is based on his hand speed and reflexes rather than his size. Once the speed and reflexes are gone, Canelo is just another short 5’8″ fighter competing against six-footers like the Charlo brothers, Demetrius Andrade and Callum Smith. For fans to be truly shocked about Canelo’s next opponent, he’ll need to fight someone that the boxing public would least expect, and that would be someone like WBA Super World super middleweight champion Callum Smith (25-0, 18 KOs). Some fans still want to see Canelo fight Gennady Golovkin in a trilogy fight, but the interest in seeing those two face each other again isn’t what it once was after their two fights in Las Vegas that ended in controversial decisions. A lot of people believe that Golovkin has no chance of beating Canelo by a decision due to his popularity. For that reason, there’s no longer a great deal of interest from fans in watching Canelo and Golovkin fight again. This writer included some light heavyweights because it’s believed that Canelo will eventually go after one of the champions at 175. Canelo said recently that he wouldn’t rule out going up to light heavyweight to take on one of the belt holders in that weight class. There’s no better time for Canelo to do that than right now. Alvarez is only 28, and he’s in his prime of his career. If Golden Boy Promotions fails to select Jacobs for Canelo’s May 4 fight, it’s going to be deeply upsetting to British promoter Eddie Hearn. He’s been banging the drum for the last month about Canelo needing to fight Jacobs. Hearn is saying that it’s the biggest fight in the middleweight divison besides a trilogy match against Golovkin. Jacobs isn’t popular though, and he’s not a big draw even in his hometown of New York If Jacobs can’t even draw in New York, then it’s probably a big waste of time for Canelo to fight him at all, period. If Canelo doesn’t care about unifying the middleweight division, then there’s no point in him facing Jacobs. Canelo can make bigger noise fighting guys like Munguia, Callum Smith, Ramirez, Beterbiev, Gvozdyk, Bivol, Jarrett Hurd and the Charlo brothers. After this Saturday, the Charlo brothers are going to increase their fan base in a substantial way with their fights against Matt Korobov and Tony Harrison. Canelo can pick and choose who he wants to fight at this point. It would be silly for him to pick someone predictable like Jacobs. He’s not going to fight GGG again, since they’ve already fought twice. If De La Hoya wants to truly shock the boxing public, then it’s got to be someone like Callum Smith or one of the light heavyweight champions. Hopefully Canelo fights a boxer, and doesn’t resort to combing through the MMA ranks to find someone with no boxing background to beat up like Mayweather is doing. That’s off putting. Canelo at least needs to fight someone from the boxing world, and not make a mockery of the sport.